For this last blog, before we say good bye to the year 2009 which has been a very good year for Kovair, I would like to focus on the use of “Kovair as a Platform on the Cloud” which simply put means that users configure their desired applications using Kovair as a Platform to create them with mouse clicks(no coding) using the Kovair Configurable Application Entities and use as required both the workflow capabilities of the Kovair Omniprocess engine and the Omnibus Enterprise Integration Bus for integrating third party applications for such implementations. Kovair in the last few months has had four such applications configuration examples in the Australian market and we would like all our readers to share in those successes and learn from them. Let me list them very briefly below. For any questions, please feel free to email to us at Marketing@Kovair.com and we would love to respond to you promptly. So, it is evident from these examples as to the versatility of the applications that can be created using the Kovair Platform that are being delivered as SaaS (Software as a Service) from a third party infrastructure in Australia. The importance of both the process workflow and integrations capabilities of Kovair are obvious where some of the popular Microsoft CRM and Sharepoint products are being integrated without having to “re-invent the wheel” in the creation of these applications. For all of you that want to create some applications without relying on your IT departments to create them for you, (they are always bogged down with other higher priorities) please contact us to work with you. You can do it with Kovair in a matter of days – not months! 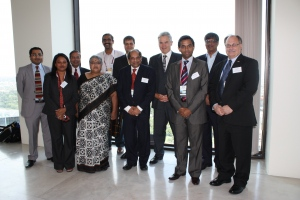 Some of the members of the NASSCOM delegation with Minister John Lenders – 4th from left second row. Bipin Shah is first from left, second row. During my last week’s visit to Australia, had an opportunity to join a luncheon organized by DIIRD of the government of Victoria in Melbourne to host a delegation of NASSCOM from India. It was a good opportunity to meet the Minister of Industry for the state of Victoria, Mr. John Lenders and some of the NASSCOM dignitaries and network with many of the visiting companies from India. I would like to thank Messrs. Ray Nicoll and Matt Carrick of DIIRD along with Dr. Richard Satur of Kovair Australasia for providing me this opportunity. The message from the government of Victoria is that they are encouraging investment as well as talent migration in the field of IT to Victoria and that it is a great place to do business. Kovair has been making that investment since May 2009. As part of my visit, I also visited the Technology Innovation Center at the University of La Trobe near Melbourne where Prof. Jack Singh, the Director of the Center and a Professor in the Dept of Electrical Engineering is working with Kovair for the installation of the Kovair Application at the University for its use in teaching and research. It will also be offered at no cost to the startup companies that are located at this Technology Incubation Center. The Agreement between La Trobe and Kovair is in its final approval state. Here again, I want to thank Prof. Singh for his interest and efforts in working with us for this program to let Kovair give back something! Thank you for taking the time to read this Blog and hope it was useful.